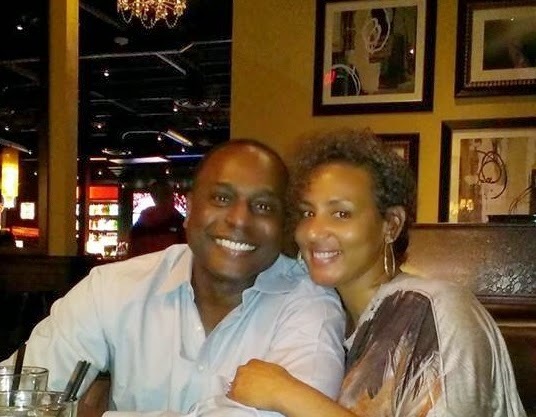 Curtis and Teresa Hill met in college. Of course he asked her out and she said "no". So what did he do? He continued to ask her out. As luck would have it, Teresa relocated and they went their separate ways. Almost 2 years later, Curtis and Teresa would reconnect at a LL Cool J concert. The reconnect turned into a connection. They joined in holy matrimony on December 1, 1990 and they have been living happily ever after. What things did you see in each other that made you want to marry him/her? Curtis: She was easily the most attractive female I had ever seen in my life, I've always strived to have the very best and she was the very best hands down! I knew after we spent time dating that she was the one for me and it went way beyond the physical. Teresa: He was persistent; he was real nice, smart, and a dark complexion to match! Once we started going out, I knew I loved him. ♥I fell in love with him early on in our relationship and I never wavered. He had my heart because he understood me like no one else ever did. Teresa, what do you love about Curtis? He loves me, with all my flaws, issues, and problems. I know he loves me for me, for who I am as a person, beyond being his wife. Curtis, what do you love about Teresa? She's the most beautiful person I know, inside and out, the most compassionate and caring person I've ever encountered. How do you keep the romance going? Curtis: I know what she needs and I work to provide it. Romance starts several hours before and after intimacy. Physical is not always romance for her, I have to invest more in emotional romance to keep it going. Teresa: I know for him it's more physical. Romance for him can be as simple as a nice meal, drinks and attention. I know his body rhythm and I move in harmony with him, he loves that. What is your favorite part of marriage? What makes it your favorite part? The companionship. We are the best of friends and we share everything, this has helped us weather many storms. We know we depend on having each other more than anyone else in our lives. What is the most important aspect in a marriage to make it successful? The ability to love unconditionally. No one's perfect, but there is someone perfect for you, but you have to accept them with their flaws, issues and quirks, cause we all have them. Unfortunately, there comes times when 'life' gets in the way and stress pokes its ugly head in...How do you get through the tough times? You love and lean on one another even more. You cash in on your emotional reserves; you find comfort in each other and within your union. Everyone needs someone to get through life's trials, but sometimes folks see past the ones who are there with them. New couples need to understand that there will be times of disagreement and it is very important in knowing how to react. With that in mind, how do you handle disagreement and problems? You have to know when to compromise, or even when to acknowledge that you're not right on this issue. Swallowing your pride can be hard sometimes, but if you placed the union above the individual you learn to do it, you know it's for the greater good. Teresa, what is the most important thing for a wife to know? When to trust him, when to bite your tongue, understand his struggle, and realizing that just because he's silent doesn't mean he's troubled. Curtis, what is the best advice you can give to other husbands? Learn to listen attentively. Learn to read beyond logic. Be there for her regardless of what you think is the best answer, even if it's not her answer, just accept it and support her. Don't be emotionally distant, she wants to hear and listen to you, she can handle it, open up to her. Any words of wisdom for the newly engaged couples that will be reading your story? People are not perfect, if you love him/her and it's reciprocated, you have something worth fighting for, hanging on to and rejoicing in. A union is truly that, it's a united responsibility. No single individual can sustain a couple, it's a shared effort. When both have a vested interest in the continued growth, maturity and security of the union it will prosper and bear fruit and ultimately reward you both with a lifelong partnered companionship.